Age 99, of Longwood at Oakmont, formerly of Fox Chapel, passed away peacefully on Friday, December 7, 2018, Pearl Harbor Day. Lewis dearly missed his beloved wife Sally, who died in February 2015 after 66 years of marriage. He soldiered on, following the Steelers, checking his stock portfolio, reading his “gmails”, and enjoying his Famous Grouse Scotch even on his last evening. He loved regular visits from his family and friends. He had great appreciation for all the caregivers who helped him during his last years. Lewis was born on May 1, 1919 in McAlpin WVA where his father served as the McAlpin Coal Company doctor. Lewis attended Mark Twain High School until a serious illness required months of recuperation. He completed high school at St. Christopher’s School in Richmond VA, graduating in 1939. 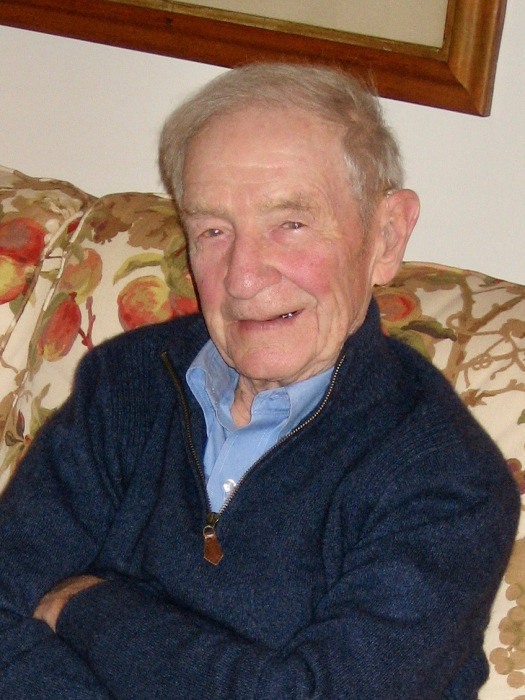 After a year at the University of Michigan, Lewis transferred to MIT to pursue a degree in naval architecture and marine engineering, graduating February 1943. Despite the challenges of joining the war effort due to his earlier illness, Lewis completed Naval Officer Training School at Princeton University. He served in the Navy for 3 years, finishing out his service in Okinawa. Lewis joined Ingersoll Rand in Boston as a sales engineer. There he swept Sally Hall off her feet and they married in October 1948. Lewis joined the Pittsburgh office of Ingersoll Rand, and spent 35 years there before taking early retirement at age 63. Lewis and Sally’s old red farmhouse in Fox Chapel with its barn, pond and fields to explore was an idyllic place to raise five children. Lewis enjoyed his retirement years immensely. Lewis and Sally visited their grown children and their families, as well as traveled the world. Lewis served in various volunteer capacities including ambulance driver for the Borough of Fox Chapel. He played tennis at the Fox Chapel Racquet Club, sailed with the Fox Chapel Navy, and served as a willing accomplice to Sally’s never-ending plans. Lewis will forever be remembered for his ability to fix nearly anything, his hand-written letters to his children, his insistence on escorting all visitors to their cars, and his bugle-playing of Taps. He was the epitome of a southern gentleman, unfailing in his gentle kindness to everyone he encountered. Lewis is survived by his five children: Lee (Peter) Swartz of Baldwin, MD, Dana (Craig) Martin of Phoenix, MD, Wendy (Mac) McCorkle of Durham, NC, G. Hall (Lisbeth) Johnson of Yellow Springs, OH, E. Wylie (Margaret) Johnson of Boulder, CO; nine grandchildren: Abbie (Dave), Emily (Andrew), Craig, Katie (Neal), Chip (Allison), Lara, Lewis (fiancé Virginia), Ellie, and Sally; three great grandchildren: Gavin, Liam and Lucy and countless other family and friends. A memorial service will be held at Longwood at Oakmont on Saturday, March 9, 2019 at 1 p.m . In lieu of flowers, the family requests support of Beechwood Farms via the Audubon Society of Western PA.